At Ouran High School, an academy where only the children of the rich and powerful attend, there exists a club consisting of the most elite of the student body: the legendary Host Club. Within the club’s room, six beautiful, bored boys spend their time entertaining equally beautiful and bored girls. Haruhi Fujioka, a poor scholarship student, has no interest in the Host Club—until she breaks a valuable vase in their clubroom. 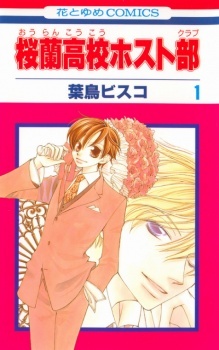 After being mistaken for a boy, Haruhi is forced by Kyouya Ootori to work for the Host Club to repay her debt. Tamaki Suou, the princely leader of the club, eagerly takes her under his wing to teach her the ways of the host. Things, however, are never quite so simple with the Host Club around. Even the most mundane events can turn into huge spectacles with the likes of prankster twins Hikaru and Kaoru Hitachiin, stoic Takashi Morinozuka, and sweet Mitsukuni “Hunny” Haninozuka. The crazy adventures of the Host Club are just beginning, and Haruhi must learn how to survive in the glitzy world of the hosts. [Written by MAL Rewrite] Note: The final volume contains a special bonus chapter where the group travels to Spain.